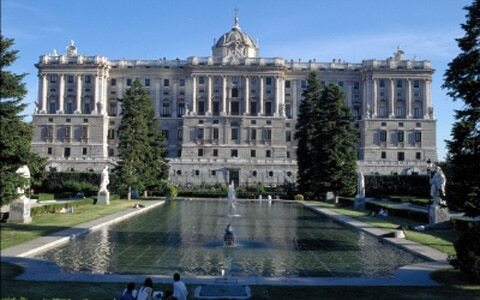 Upon arrival to Madrid Airport you will be met and transferred to your hotel in the city centre. During the afternoon meet with your local host/ess in the hotel for a welcome briefing regarding your available options whilst in Madrid. Tonight a Tapas-Dinner is included at a local restaurant, to sample the delicious Spanish food. Breakfast at your hotel. 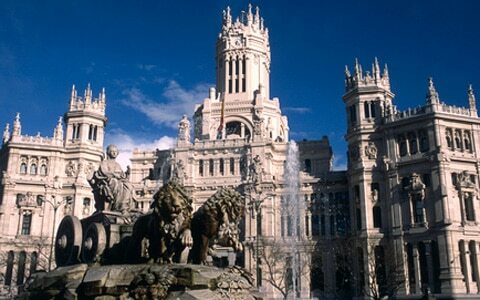 This morning you will enjoy a guided City Tour of Madrid. Sightseeing tour through the most important and representative avenues, streets and squares of the city, to admire its buildings and monuments. The oldest quarter with its densely built streets, constitute what is know as Madrid’s Seventeenth Century “Austrian” quarter where the austere exteriors of its palaces contrast sharply with their luxurious interiors. 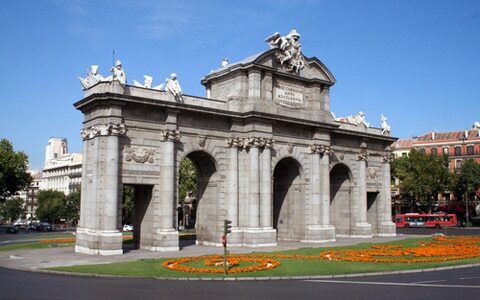 Eighteenth Century neo-classical architecture is splendidly represented in the Royal Palace, the Sabatini Gardens and “Campo del Moro”, the Alcalá Gate, Paseo del Prado and famous Cibeles and Neptuno fountains. Madrid most modern and avant-garde tendencies are to be found in its newer quarters, with their orderly street layout such as the “Gran Via” built early in the 20th Century, and the “Paseo de la Castellana” ,in turn, which cuts across the city from North to South, is lined by boldly designed avant-garde buildings and crowned by the twin towers known as the Gate to Europe, which have come to symbolise modern Madrid. The Royal Palace, a beautiful exponent of the 18th Century and one of the best preserved in Europe, constitutes one of the most beautiful distinction of the royal residence style, the permanence symbol making firm Madrid as the political capital of the Kingdom, in which the most bright official receptions of the Crown are taking place. Audiences, Gala Dinners, signature of important agreements and the very traditional ceremony of Credential Letters from Foreign Ambassadors to His Majesty The King. Breakfast at your hotel. Departure for a Full Day Tour to Toledo including Lunch. Declared World Heritage City. Successively a Roman “municipium”, the capital of the Visigothic kingdom, a fortress of the Emirate of Cordoba, an outpost of the Christian kingdoms fighting the Moors and, in the 16th Century, the temporary seat of the supreme power under Charles the 5th, Toledo is the keeper of more than two millennia of history. Its masterpieces are the product of heterogeneous civilisations in an environment where the existence of three major religions –Judaism, Christianity and Islam– was a major factor. Cradle of Monarchs, and the seat of principal archbishops, Toledo constitutes a tourist attraction point of first order sheltered in the knowledge stored in its Mosques, Synagogues, Churches and Convents. 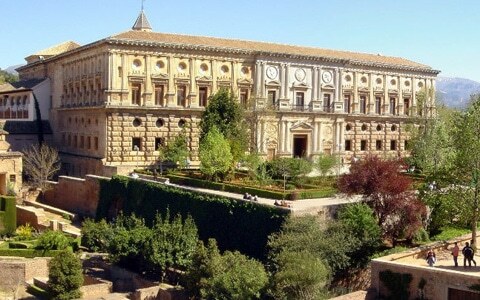 The Cathedral, the monastery ofSaint John of the Kings, the doors and the walled enclosure or the Alcazar portray the special attractiveness of its streets and plazas.They surround the traveller with an enchantment as Becquer or Galdos described, and El Greco portrayed in his paintings. Lunch in Toledo is included. Return to Madrid. Breakfast at hotel. Departure transfer to ‘Atocha’ railway station to board the high-speed train (AVE) for a 2:30 hours trip to Seville. Upon arrival to Sevilla “Santa Justa” station you will be met and transferred to the hotel in the city centre. Breakfast at your hotel. This morning we will enjoy a panoramic tour of the capital of Andalucía wich is internationally renowned and has an impressive monumental heritage. The excursion offers a panoramic tour of this monumental city, the cared for gardens at Maria Luisa Park, the Plaza de España and a walking go round through the typical and delightful district of “Santa Cruz”. This tour also includes a visit to the Cathedral (15th C.) the largest Gothic Church in Christendom, with its magnificent chancel, carvings by Martinez Montañez and painting by Murillo, Zurbaran and Goya. Of the Almohade Aljama Mosque (12th C.) there remains its striking minaret, the slenderest tower in Muslim architecture – the “Giralda”, to which an exquisite bell tower was added in the 16th Century. Enjoy an included Andalusian lunch at a local restaurant. Rest of the day at leisure to discover other interesting sights of the city such us the Royal Palace of the Alcázar with its medieval entrance -The Puerta de Leon-., or the Palacia de Lebrija, Casa de Pilatos, Macarena Virgin Basilic, etc. Breakfast at hotel. Depart by bus to Cordoba, the seat of of the independent Caliphate. It was during the 10th Century, the most densely populated city of the old Continent and its splendour dazzled geographers, chroniclers and travellers alike. Abderrahman 1st initiated in the 8th Century the construction of the Aljama Mosque, one of the most emblematic buildings of Islamic Art. Extended on various occasions, for the last time by Almanzor on the 10th Century. It is a fascinating building which offers surprising light and colour effects, as well as, beautiful doors and nearly a thousand columns. The Cathedral of Gothic, Barocque and Plateresque elements was built inside, in the 16th Century. The panoramic tour shows the Roman Bridge displaying the restoration work performed by the Muslims. The “Juderia” (Jewish Quarter) with its Synagogue, situated near “La Aljama” district. The Gate of Almodovar and the Alcazar of the Christian Kings. The panoramic tour shows the Roman Bridge displaying the restoration work performed by the Muslims, the “Juderia” (Jewish Quarter) with its Synagogue situated near the “Aljama” district and the Alcazar of the Christian Kings. Lunch on own. Later in the afternoon, continue the drive to Granada the ancient capital of the Arab – Nasrid Kingdom.Arrival and check-in at hotel. Tonight enjoy an included Dinner at a local restaurant located within walking distance from the hotel. There are very few cities which have such a dense history so well reflected in the many monuments, in its appearance an in the atmosphere of its daily life. 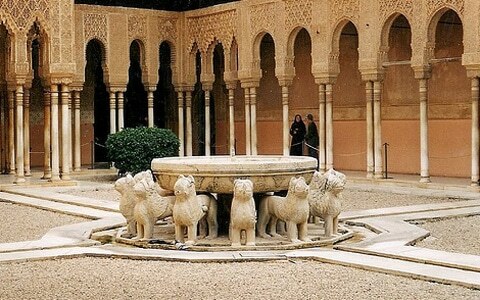 Today we will visit the Alhambra (13th – 15th Century), a fortified palatine city, built by the Nasrid Dynasty , which also includes its Alcazaba Citadel and the Palaces of “Los Leones” and “Comares”, The “Generalife”, a summer residence set in beautiful gardens, The so-called “Royal Room of Santo Domingo” built in the orchards of Almaxarra, The Palace of Alcazar Genil used by the Nasrid Queens, The Palace of Charles 5th, designed in 1526 by Pedro Machuca in the heart of the Alhambra as a symbol of new power, in the most outstanding Renaissance work in Granada and possibly in Spain. Lunch is included today. Balance of the day at leisure. Departure transfer to Railway station in Granada for boarding the train to Madrid. Check-in hotel. Rest of the day at leisure..
All departures are guaranteed if the reservation is made 60 days before the start of each tour. If the request is made after this deadline, booking is subject to confirmation.